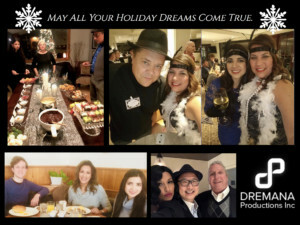 Christmas 2018 had Team Dremana in the Windy City, and all kinds of other geographical locations for our team members – visiting friends, family, and spending time at client holiday parties as well! (Oh my does NMLP know how to throw a holiday event; this year it was a roaring 20’s theme… and did it ROAR!) For the Dremana crew, especially Grace & Andre, certain clients truly become close friends. In the case of Al & Pat Bastidas of Please Be Kind to Cyclists, the years have brought them very close to our hearts, so enjoying a full fondue dinner spread – with Catheryn’s divine dessert-making skills – and playing charades into the wee hours is how that shows up in the world.